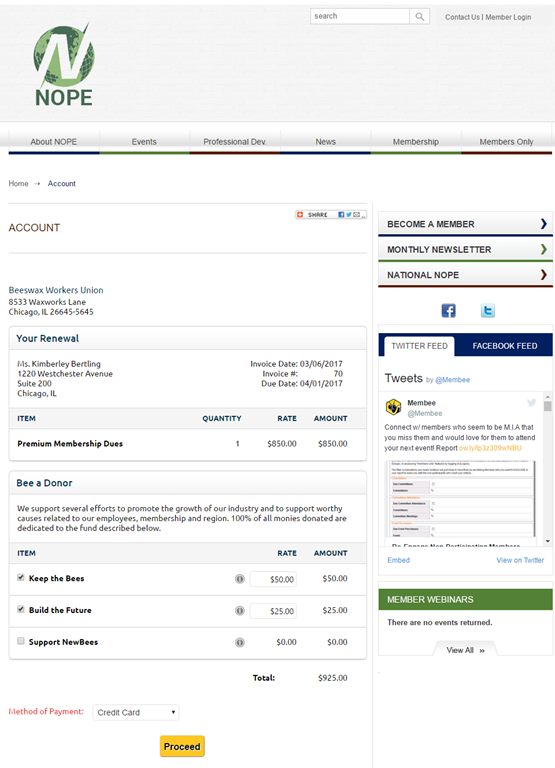 Making it as easy as possible for donors to participate is important so many Membee client organizations dedicate a top-level menu choice on their website to donations. This is easy to do since Membee automatically generates a unique URL for each event you create. So, a prominent “Donate” menu choice contains the URL for your donation event. It is also common to place a “donate now” button in your website’s sidebar so the option to donate is visible on all pages. Once again, the URL behind your “donate now” button is the URL for your Membee donation event. 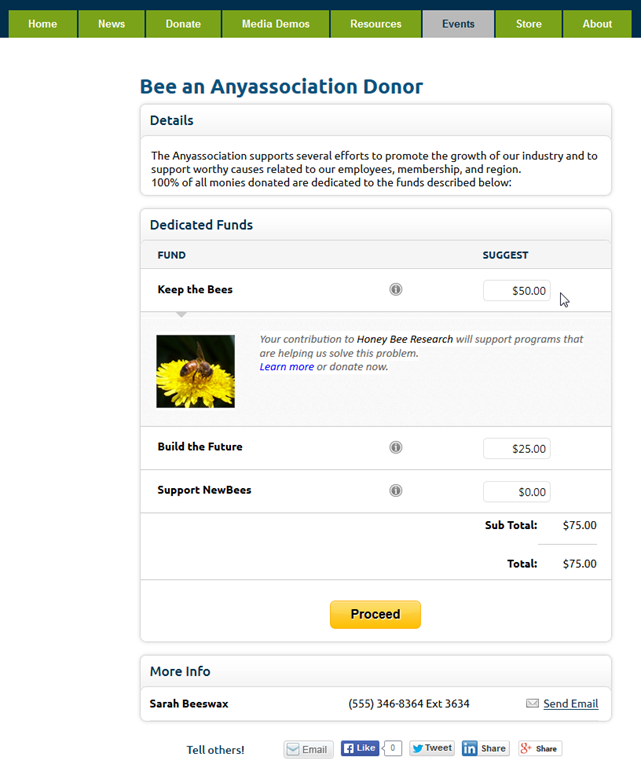 Whether you add a menu choice, a donate button or both, the donor is redirected to your Membee donation event. Get Members to Donate When They Renew! Membee has made it easy for your members to donate! 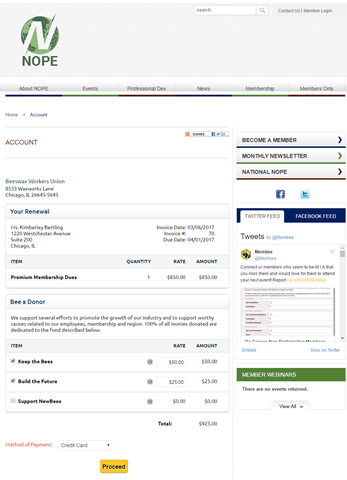 Users can now donate right at the checkout when renewing their memberships! This feature will increase donations just by simply increasing visibility! Members may not always be aware you are accepting donations for specific causes, projects etc., so setting up this feature will reach those who are seeking to donate AND those who happily stumble upon it when renewing! Easy to set up for the Users! 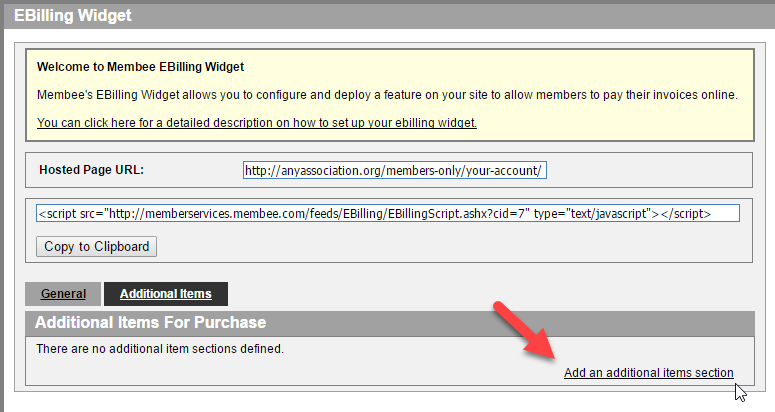 Just go into the eBilling Widget >> Additional Items, and you will see where to set up your donation! Once set up every member who renews will see where to donate! The visibility is invaluable. You can also set up this feature in New Member Signup so your new members can donate as they become members, pretty cool huh? Charitable Receipts are setup so those who donate are able to get a receipt and claim the donation when doing their taxes. Having the option of a Charitable Receipt is just furthering the reasons why your members will want to donate! There is an informative page in Membee’s Help from the Hive documents all about Charitable Receipts that can guide you through how it works, why you do it, and instructions to get it all setup! Login is required for access. To see how to set up an event to collect donations Click Here. (Remember to have your Membee username and password ready to access the article).